From the moment I pulled The Vanishing Tower from the bookshelves of my high school library, I became infatuated with Michael Moorcock’s Eternal Champion. Awestruck by Michael Whelan’s cover, which depicted a giant bug on a throne being challenged by the albino Elric, I was totally captivated. Up to that point my only exposure to fantasy had been The Hobbit and The Lord of the Rings. Elric was something wonderfully different. Lord of the Rings was a carefully crafted tale full of structured language, culture, and a single, laser-focused plot. Elric, on the other hand, was wildly imaginative, adventuring where whim took him, the plot shifting like the stuff of Chaos to which Elric was beholden. After I devoured Elric, I moved on to Corum, then Dorian Hawkmoon, then Erekose, and finally Von Bek. All too soon I had run through the entire Eternal Champion Cycle and was left with fading memories. For awhile I occasionally satisfied myself with bits and pieces – short stories, Elric at the End of Time, The Fortress of the Pearl, and The Revenge of the Rose. I was initially disappointed at the start of The Dreamthief’s Daughter. You see, the Dreamthief originally appears in The Fortress of the Pearl, an Elric novel, so I was expecting a book about Elric. Instead the story opens with Ulric Von Bek…not he of The War Hound and the World’s Pain, but rather a descendant living in Germany during the rise of the Nazi Party. In fact, the first 80 pages are, to borrow a phrase Moorcock uses later in the story, “philosophical meanderings,” and they are a look into the emergence of Nazi Germany. Despite the slow pace and the meanderings, I was still interested. At one point I Googled a map of Germany to find out where these places were in relationship to each other, and what they look like now. The fact that Moorcock has tied his Von Bek and Elric storylines to actual places and events in our own world within the last century is rather intriguing. After that the story, in true Moorcock fashion, dives into the fantastic, the imaginative, the absurd. It’s delightful in the way Moorcock can describe unknown places and creatures, the way combatants spar verbally as well as physically, the way the fabric of the multiverse is traveled, bent, and torn; its formative nature revealed, manipulated, and threatened. Yet it’s disturbing in the way that transitions between character viewpoints are muddled, the actions of certain characters are questionable at times, and some things are left unexplained and do not look to be resolved. The biggest problem I have with this story as it stands is that it does not fit with other Elric novels. It’s not clear exactly when the story takes place during the Elric saga…it is after he met the Dreamthief and after he killed his love, and he is adventuring with Moonglum but they are in Tanelorn. 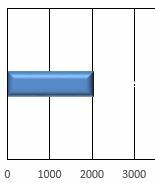 So chronologically there should be at least a book or two after this. However, because this story (and The Fortress of the Pearl) have been shoehorned in after the original series, the fact that Elric now has a daughter and yet never speaks of her in that original series (because she didn’t exist when they were written) is glaring. The same could also be said of his knowledge that Von Bek is another aspect of himself. In the original series, often external forces would cause Elric to lose memory of meeting other manifestations of himself, but that does not appear to happen here. Perhaps this will be addressed in The White Wolf’s Son. We shall see, since that book has been added to the queue. 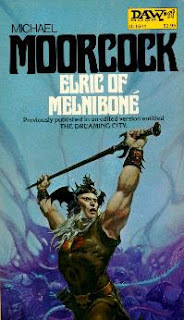 In an introduction to one of the Chronicles of the Last Emporor of Menibone (I’m not sure which one), Moorcock describes The Dreamthief’s Daughter as a way to bring Elric into a contemporary setting. But the story is much more than that. I recommend heading over to Amazon and reading Academon’s review of what this book represents. It is outstanding commentary and shows that the book transcends merely bringing Elric into the now.